Growing plants indoors isn’t just for hydroponics growers who use artificial lighting and high-tech climate controls. Houseplants are hundreds of varieties of plants that can survive and sometimes even thrive indoors without expensive, specialized equipment, materials or care. They provide visual stimulation, freshly-generated oxygen, air filtering, removal of carbon dioxide (C02) from air, and many other benefits. Before choosing houseplants for your home, office or other interior space, get some books on houseplants, visit a well-stocked gardening center, or otherwise familiarize yourself with the care needs, growth characteristics, appearance and other features of houseplants. This is a classic indoor plant with thick leaves. It looks like a miniature tree, and it can grow to be several feet tall and several feet wide. These plants need quite a bit of light, so they are not suitable for dark rooms that lack outside-facing windows. These plants can get top-heavy and tip over, so you have to make sure that the type and size of pot you use for it is adequate to keep the plant from falling over. Once you have one of these plants, you never have to buy another one. To make new Jade plants, just cut off a branch, put it in water with Advanced Nutrients Jump Start, wait until a few inches of root develop, and then put it in grow media. This plant is a cascading vine with attractively-shaped deep green leaves. Many growers put them in hanging baskets. These plants are vines that can be trained to cover any surface. They tolerate low light conditions and can even be grown in rooms without outside-facing windows, but it is useful to augment the light in those rooms with at least a small grow light bulb so that the plant isn’t struggling in the dark. It’s easy to propagate ivy: just cut off a portion of the vine, stick it in water with Jump Start until it develops roots, and then put it in grow media in its own pot. The Mother-in-law’s tongue and Snakeplant varieties of this plant are tall; the Bird’s-nest plant is short. These plants can handle harsh conditions with temperature extremes, low light, dust and other environmental hazards. They can handle being potbound, so don’t repot them unless the pot is too small to keep the plant upright, or if the roots are about to break the pot. You can propagate this plant by detaching the plantlets that grow off the main stem, and then immediately placing them in soil after treating them with Advanced Nutrients Organa Root. This plant can do well in almost any amount of light. It’s also easy to make new plants, because miniature plants grow on long stems that hang down from the main plant. All you have to do is put these plantlets in water with Advanced Nutrients Jump Start until they sprout roots, and then put them in their own pot when their roots are a few inches long. Spider plants can handle having their roots crammed into a small pot, which means you don’t have to upgrade the pot very often. This is one of the most common houseplants, and is often grown in hanging baskets to permit it to generate long stems that hang down in a festive manner. Despite being a palm tree, parlor palms don’t need a lot of full sunlight. It can handle low light conditions, and it does not require daily watering in most indoor environments. This attractive plant reminds people of the tropics and can grow to several feet tall. Rubber plants are a long-time favorite for houseplant hobbyists because they don’t need much care, but they look great and can grow quite large. They need to be grown in a place that has window or skylight access to two or more hours of direct sunlight every day. This plant comes in two main forms. The Easter cactus flowers around Easter; Christmas cactus flowers in late autumn or early winter. It’s interesting that this plant is not actually a cactus. It’s from a plant family called “succulents.” It needs several hours of good sun or artificial light exposure every day, and moderate but not heavy amounts of water. There are many types of Dracaenas. Some are easier to grow than others are. They need lots of light and a reasonable amount of watering. These plants can grow to be as much as four feel tall. This is an attractive, easy to grow plant that has proven medicinal uses. The gooey inner sap found in the thick, succulent leaves can treat burns, scratches, itch, other skin conditions, and is also used as a nutritional/digestive supplement. Aloe is a desert plant that likes a lot of light and not much water. They will produce plantlets near the main stem. These can be detached and rooted. African violets are among the world’s most favored houseplants. Look for a specialty article about Violets on this website. African Violets need strong sunlight every day. If they are in a place where they aren’t getting enough light, they will stretch their leaves towards whatever light is available. You have to water them from the bottom of the pot via a tray or reservoir: if you get water on their leaves, it damages the leaves. You’ll notice that most African Violets are being grown in small containers. That’s because being rootbound actually encourages the plants to flower. These plants are more temperamental than most houseplants and do best when growers have good knowledge of proper cultivation techniques and use specialized root zone media and fertilizer. Selecting the right variety of houseplants has a lot to do with what you want out of the plant and where you will be growing it, but selecting plants that are healthy and properly grown before you buy them is a bit more generic. Select only plants that are free of insects and diseases. Examine undersides of the foliage and axils of leaves. Shake plants and look for any insects that fall or fly off. Look at the soil and root zone to find out if there are fungi, pests, or other visible problems. Select plants that are sturdy, clean, well potted, shapely, and covered with healthy leaves. Avoid plants that have yellow or chlorotic leaves, brown leaf margins, wilted or water soaked foliage, spots or blotches and spindly growth. Avoid plants with leaves that have suffered from mechanical damage, and those that have been treated with “leaf shines” to add an unnatural polish to the leaves. New flowers and leaf buds, and young growth in general, are signs of a healthy plant. It’s far better to purchase and grow a plant that thrives in the same environmental conditions where you intend to grow it rather than to get a less-appropriate plant and try to alter the plant or your home or office to make the plant grow well. If you have to move houseplants outside the building where they are growing, remember that transporting plants can damage them, especially if you transport them when it is very cold or very warm outdoors. In hot weather, avoid placing plants in a car and leaving the car closed. Plants can be burned by direct sun. During winter months, if you absolutely have to transport a plant, wrap it with plant cloth, newspaper or paper bags and make sure you get it back into a warm environment as soon as possible. Keep the plant in the passenger compartment of the car with the car heater on: the trunk of a car is too cold to carry plants safely during winter months. On an extended trip, make special arrangements so that plants will not be damaged by cold. Many houseplants will be damaged or killed if they endure temperature below 47 F for more than a few minutes. Research shows that houseplants grown in full sun have leaves that are structurally different from leaves of plants grown in shade. Sun leaves have fewer chloroplasts and thus less chlorophyll. Their chloroplasts are located deep inside the leaves and the leaves are thick, small and large in number. Shade leaves have greater numbers of chloroplasts and thus more chlorophyll, are thin, large and few in number. When plants are grown in strong light, they develop sun leaves that are photosynthetically inefficient. Photosynthesis is a primary metabolic function that keeps plants alive. 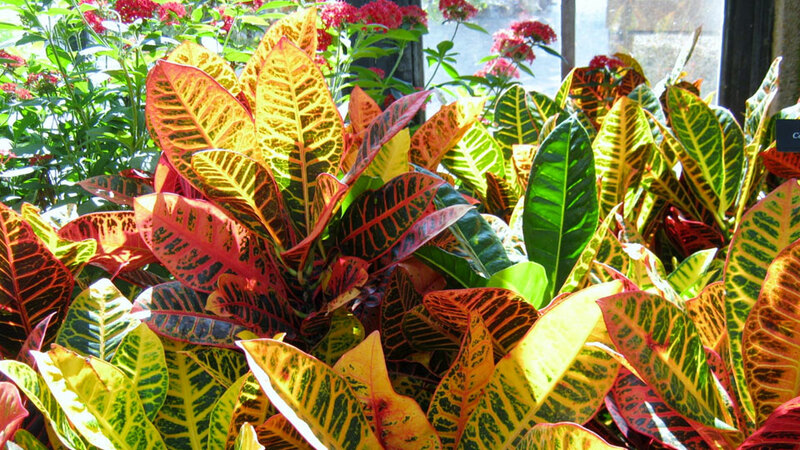 If these types of plants are placed in low light, they have to get rid of their sun leaves and make shade leaves, which are photosynthetically more efficient. To reduce the shock that occurs when a plant with sun leaves is placed in shade, gradually reduce the light levels it is exposed to. This is called acclimatization. Houseplant growers should acclimatize plants that they intend to place outdoors in summer by gradually increasing light intensities. Reverse the process if you are bringing plants indoors for autumn after they are outdoors for summer. For newly purchased plants, acclimatize them by initially locating them in a high light (southern exposure) area; gradually get them used to their permanent place where you intend for them to stay, especially if that place has less light. Light is an essential factor for plant growth. The growth of plants and the length of time they remain active depend on the amount of light they receive. Light is necessary for all plants because they use light for photosynthesis. When determining proper light levels for houseplants, there are three factors to focus on: (1) intensity, (2) duration (3) quality. Light intensity influences the manufacture of plant food, stem length, leaf color, and flowering. A geranium grown in low light tends to be spindly with light green leaves. A similar plant grown in very bright light would be shorter, bushier and have larger, dark green leaves. Houseplants are classified according to light needs. The intensity of light an indoor plant receives depends upon the nearness of the light source to the plant (light intensity decreases rapidly as distance from light source increases). If the room the plant grows in has windows, the direction the windows face affects the intensity of natural sunlight plants receive. Southern exposures have the most intense light. Eastern and western exposures receive about 60% of the intensity of southern exposures. Northern exposures receive 20% of a southern exposure. Southern exposure is the warmest. Eastern and western are less warm and a northern exposure is the coolest. Light intensity from window lighting is influenced by curtains, trees outside the window, weather, seasons of the year, shade from other buildings and cleanliness of window. Reflective (light colored) surfaces inside the home/office will increase the intensity of light available to plants. Dark surfaces decrease light intensity. Day-length or duration of light received by plants is of importance, especially with plants that depend on day-length to tell them when to flower or otherwise go into different growth phases. Poinsettia, kalanchoe, and Christmas cactus bud and flower only when day-length is short (11 hours of daylight or less). Low light intensity can be balanced by increasing the time (duration) the plant is exposed to light, as long as the plant is not sensitive to day-length in its flowering response. Increased hours of lighting allow the plant to make sufficient food to survive and/or grow. However, plants also require darkness and thus should be illuminated for no more than 16 hours every 24. Excessive light is as harmful as too little light. When a plant gets too much light, leaves become pale, turn brown, or die. If plants do not get enough light from windows, additional lighting can be supplied by either incandescent or fluorescent lights. Incandescent lights produce lots of heat and are not energy-efficient. Most houseplants grow well under white fluorescent lights and these lights are cool enough to position quite close to plants. Blooming plants benefit from a warmer light color. Warmer means that that the light should be more orange and less blue. Visit a professional gardening store to find out about the different types of lights for different needs of houseplants. Light can be considered a form of essential nutrient that plants must have if they are to grow well. Another obvious essential is water, but most houseplant growers give their plants too much water. Overwatering and underwatering cause lots of damage to houseplants. The most common question home gardeners ask is, “How often should I water my plants?” There’s not a uniform answer to this question because houseplants have different needs, depending on variety, growth phase, time of year, etc. Differences in soil or potting medium and environment influence water needs. Houseplant roots are mostly in the bottom two-thirds of the pot, so do not water until the bottom two-thirds starts to dry out slightly. You can’t tell this by looking. You have to feel the soil. For a 6-inch pot, stick your index finger about 2 inches into the soil (approximately to the second joint of your finger). If the soil feels damp, don’t water. Keep repeating the test until the soil is barely moist at the 2-inch depth. For smaller pots, 1 inch into the soil is the proper depth to measure. Some growers buy soil water meters that give a moderately accurate reading of how wet the root zone is. Water the pot until water runs out of the bottom. This washes out excess fertilizer residue, debris and cleanses the roots. It brings oxygen to the roots. It ensures that the bottom two-thirds of the pot, which contains most of the roots, receives sufficient water. However, don’t let the pot sit in water that runs out. After a thorough watering, wait until the soil dries at the 2-inch depth before watering again. When you test for watering, you should also monitor the porousness of the soil. Soil that is too dense, too matted, or too packed with roots is bad for root function growth. If your finger can’t penetrate 2 inches deep, you either need a more porous soil mix, or the plant is becoming root-bound. One final issue that needs to be considered is that tap water and well water in many locales is polluted. You might consider using clean water sources, having your water tested, or using additives like Advanced Nutrients Well Water Micro that will help your plants overcome problems caused by polluted water. Houseplants can tolerate temperature fluctuations within a range of 59 to 89 degrees F. Temperatures higher or lower than this range can damage plants. Some of these fluctuations will mirror normal fluctuations in daytime and nighttime temperature that plants would experience in their normal habitat outdoors. Higher daytime temperatures and lower night temperatures are beneficial to the plant’s metabolism, self-repair and other functions. Atmospheric humidity is stated as a percentage of the moisture saturation of air. Some plants need a humid environment. Other plants do poorly in humid environments. If your plants need increased humidity, you could attach a humidifier to the heating or ventilating system in the building the plants are in, or place gravel trays in which an even moisture level is maintained under the flower pots or plant containers. This will increase the relative humidity near the plants. Another way to raise humidity is to group plants close together or spray a fine mist on the foliage on a regular basis during the time when the plant is receiving light. Do this early in the day so that the plants will be dry by night. Dampness on leaves at night provides an ideal environment for disease. Houseplants, especially flowering varieties, are sensitive to cold or hot drafts of air. Forced air heating can dry plants rapidly, harm root systems, and may cause other damage or plant loss. Houseplants are sensitive to natural or blended gas heat and fumes. When exposed to gas or other pollutants, some plants refuse to flower and others drop flower buds and foliage. Blended energy gases are more toxic to house plants than natural gases. Tomato plants are extremely sensitive to gas. They will turn yellow before the escaping gas is detected by household members and are sometimes used in greenhouses as indicator plants for excessive ethylene gas resulting from incomplete combustion in gas furnaces. Houseplants need quality fertilizers containing three major plant nutrients (nitrogen (N), phosphorus acid (P), and potassium (K). They also need what are called micronutrients. Unfortunately, almost all the fertilizers available at discount stores, garden shops and other retail outlets are inferior, poorly-designed formulations that can actually do more harm to houseplants than they do good. Most of them have generic ratios of major nutrients. For example, you might see 20-20-20 on a fertilizer label. This means that there are equal amounts of N, P and K. Problem is, equivalent amounts of N, P and K in fertilizer is not a good ratio of those major nutrients. It doesn’t fill them specific needs of any phase of plant growth. Most houseplants need more nitrogen than they need other nutrients during certain stages of growth, or they might need more phosphorus. If you use generic fertilizers, your plants aren’t getting the proper ratios of nutrients that will help them give the best growth and be the healthiest. In many cases, inferior ratios of inferior nutrients in poorly-absorbed fertilizers create toxic situations that harm or kill plants. Reduced growth, brown leaf tips, dropping of lower leaves, small new growth, dead root tips, and wilting are all signs of poorly designed fertilizers. Some growers using inferior fertilizers will see how insoluble fertilizer “salts” accumulate at the top of the soil forming a yellow or whitish crust. Fertilizer salts might be visible on clay pots and around pot drainage holes. In the root zone, inferior fertilizer components accumulate to provide a toxic environment for roots. Plants with toxic root zones grow poorly, but many growers (not realizing that the problem is caused by fertilizer), react by applying more fertilizer. No matter what fertilizer you’re using, it’s a good idea to pour distilled water through your root zones to rinse the roots and remove debris. This should happen every 6 weeks. At least three times a year, you should rinse the roots with distilled water that has been infused with Advanced Nutrients Final Phase. Final Phase is a safe, easy to use root zone cleansing product that will remove garbage from your root zone and plants. Another beneficial root zone treatment is Advanced Nutrients SensiZym. This product contains nearly 100 enzymes that facilitate plant metabolism and clean out the root zone. Another way to ensure good growth, healthy plants and safe root zones for your houseplants is to use only Advanced Nutrients fertilizers and additives. There are many benefits to your plants when you use Advanced Nutrients fertilizers and additives. You can custom blend Advanced fertilizers to give your plants exactly what they need when they need it. The fertilizers are made from high quality materials that are easily absorbed by plants. The company offers several formulas, and an interactive nutrient calculator- so you can custom blend fertilizer components that will give absolute and total control over what your plants eat. That’s the way to help them be as healthy and beautiful as they can be. The potting soil or other root zone media in which a plant’s roots grow must be of good quality. It should be porous for root aeration and drainage but also capable of water and nutrient retention. Most commercially prepared mixes are “hydroponics sterile media,” which means they contain no soil and are made of sterilized material that contains no impurities- but also no nutrients. You have to provide all the nutrients. That’s why it’s very important to choose the best nutrients, because your plants will not be getting nutrients from organic matter in the root zone. And even if you use soil as your root zone media, you still need to use fertilization so you can max out your plant’s potential and keep it healthy. The most popular type of 100% sterile media is called rockwool. This material resembles fiberglass insulation material. It’s pliable, holds water well, and releases nutrients to roots in an efficient manner. Most other types of hydroponics media are less than 100% sterile and may contain some organic components. These include sphagnum moss and coco coir. Commercial houseplant root zone mixes often contain organic matter such as peat moss or ground pine bark combined with sterile material, such as washed sand, vermiculite or perlite. Peat Moss is available as baled or bagged sphagnum peat moss. Materials such as Michigan peat, peat humus, and native peat are usually too decomposed to provide necessary structural and water-drainage characteristics. Most sphagnum peat moss is acidic (pH ranging from 4.0 to 5.0) and has few nutrients. This is a good media for hydroponics, because it is almost sterile. Vermiculite is a sterile, light-weight mica product. When mica is heated to approximately 1,800o F., it expands its plate-like structure. Vermiculite will hold large quantities of air, water and nutrients needed for plant growth. Its pH is usually in the 6.5 to 7.2 range. Vermiculite is available in four particle sizes. For horticultural mixes, sizes 2 or 3 are generally used. If at all possible, the larger-sized particles should be used since they give much better soil aeration. Vermiculite is available under a variety of trade names. It contains absolutely zero nutrients but is known for holding plant roots and water well and for properly releasing hydroponics nutrients to roots. Perlite is a sterile material produced by heating volcanic rock to approximately 1,800 degrees F. Perlite is a lightweight, porous, and whiter. Its principal value in soil mixtures is aeration. It does not hold water and nutrients as well as vermiculite. The pH is between 7.0 and 7.5. Remember that the ideal pH for plant roots is 5.8 to 6.3. This is the ideal range in which plants can uptake nutrients most easily. If pH is too far out of range, plants might not be able to uptake nutrients. It is useful to get a pH measuring device and adjust your pH using Advanced Nutrients pH Up or pH Down. Perlite can cause fluoride burn on some foliage plants. Fluoride damage is usually seen on the tips of the leaves. The burn progresses from the tip up into the leaf. Fluoride burns can be prevented by adding 1 1/2 times the recommended amount of lime when mixing the soil. Coco Coir is made from the hulls of coconuts. There are various processing methods used to turn hulls into root zone material. They involve reconfiguring the physical nature of the coir so it holds roots and water better and is easier to work with. It also involves partial cleansing. Coco coir contains some natural nutrition as well as anti-fungal properties that help plants resist disease. It is ideal for holding roots and can be re-used. Coir has unique physiochemical properties that can cause problems involving phosphorus, potassium, magnesium and calcium. That’s why smart growers use Advanced Nutrients Monkey Juice, which is the only fertilizer specifically designed to work perfectly with coco coir so plants grow well and are not damaged by coir’s nutrient problems. Plant containers should be large enough to provide room for root zone media and roots, have aeration space, provide bottom drainage space, and able to hold the plant that’s in it. Some materials used to make plant containers are ceramics, plastic, fiberglass, wood, aluminum, copper, brass, and many other materials. Clay and ceramic containers with drainage holes are often used for houseplants They’re very porous and can absorb or lose moisture through their walls. Often, the greatest accumulation of roots is next to the walls of the clay pot, because moisture and nutrients accumulate in the clay pores. Clay pots provide excellent aeration plant roots and are seen as the healthiest way to house plant roots. Ceramics are usually glazed on the outside and sometimes also on the inside. Sometimes they lack drainage holes, which make them unsuitable as houseplant containers. Plastic and fiberglass containers are inexpensive, are easy to sterilize and clean, reusable, and unbreakable. They do not breathe, and they can impart plastic toxins to plant roots. No matter what type of container you use, houseplant roots grow and sometimes become too large for their containers. Plants that are potbound may wilt or otherwise grow poorly because the roots are strangling each other. Don’t be afraid to remove the plant from the pot and examine the roots to see if they are dry, crowded, overwet, or diseased. To remove the root ball from the pot, invert the plant and tap the edge of the container on a solid object while holding the plant and soil ball. If the soil mass is completely enveloped in roots, the plant needs repotting. You can also figure out that the plant needs repotting if you see roots growing outside of or attempting to exit the bottom of the plant container! When you repot plants, make sure to treat them with Advanced Nutrients No Shock, which is a formula that helps plants recover quickly from having their roots disturbed. Potting media should be moistened before repotting begins. To repot, place drainage material in the bottom of the pot, if desired, and some new soil. If the plant has become root bound it will be necessary to cut and unwind any roots that encircle the plant, otherwise the roots will never develop normally. Make sure to flush the plant’s root ball before you put the root ball into the new container. It’s a good idea to remove the top inch of old root zone media and replace it with new root zone media when you repot. Houseplants are hardy and adaptable-that’s why people can grow them indoors. But they are plants, and plants can fall victim to many diseases and problems. Wilting or partial wilting is an obvious sign of trouble. If sudden wilting occurs, check the roots, pot or soil for lack of water, excess water, root rot, and fertilizer problems. Sudden loss of leaves is frequently caused by a rapid temperature change. It may also be caused by such factors as prolonged hot or cold drafts, dry air, exposure to gas or furnace fumes or by changing the location of the plant from a sunny to a dark location. Ficus benjamina, commonly called weeping fig, frequently has sudden leaf drop when moved to a location that has lower light intensity. Nutrient defects can cause unhealthy or yellowing leaves. First, flush the root ball. Then, use Advanced Nutrients Revive to rejuvenate the plant. Revive contains high quality nutrients and the added benefit of iron, which has been proven to help plants come back from deficiency syndrome. If the foliage does not appear greener after three to four days, the plant may have very serious problems, and those problems are probably NOT related to nutrient issues. The yellowing and death of lower leaves may occur if plants become pot bound because of extensive root development. Rubber plant, Dracena, Diffenbachia and other woody plants are especially prone to this. When lower leaves first start to yellow, flush the root zone, apply Revive and repot the plant. Please not that some species normally drop their leaves. Check with a horticultural expert to see if it’s normal for the plant you have to drop its leaves. Yellowing of all leaves and slow growth can be caused by excessive watering, which leads to root rot. Root zone media or plugged drainage holes can also lead to root rot, especially if the roots are surrounded by water so that they lack aeration and oxygen. To determine if there are root problems, remove the rootball from its container and visually examine roots. Healthy roots and root tips will be white or cream-colored. Rotted roots are a brown-black color and may appear slimy. Severely rotted roots may be hollow and easily broken between the thumb and index fingers. Destruction of the roots by soilborne fungi and nematodes may cause a yellowing of the entire plant. Advanced Nutrients is the only hydroponics company that makes safe, easy to use products that can defeat pathogens, pests and diseases that attack plants. Other than proper flushing, quality fertilizer, using good root zone media, proper watering, and proper environmental conditions, you can use Advanced products to defeat the many problems that plague houseplants. To fortify the houseplant rootzone, use Advanced Nutrients Piranha, Scorpion Juice, Tarantula, and Barricade. These formulas prevent diseases in the root zone. They also strengthen the overall plant from the inside out and from the outside in. They are safe, non-toxic formulas. They strengthen plants to resist pests, diseases and other pathogens. Severe infestations of mites, aphids and scale insects, fertilizer burn, improper light and temperature, or improper pH all may cause plant yellowing. The term “pH” refers to acidity or alkalinity of soil measured on a scale of one to 14. Seven is neutral, and 5.8-6.3 is ideal for most houseplant, although there are several types of plants that prefer a very acidic or very alkaline soil. Any pH below seven is called acidic; anything above seven is alkaline. Norfolk Island Pine, Boston fern and a few other types of plants need acidic root zones. Too bad that pH isn’t the only thing that can harm your plants. Leaves that are spotted in a way that looks like a disease may be infested with spider mites. When mites are present, upper and lower surfaces of leaves are encased in mite webbing. To check plants for spider mites, shake several suspect leaves or branches over a sheet of white paper. Look closely at specks that fell on the paper. If they are moving, they are spider mites. They should be treated with natural insecticidal soap, or with Advanced Nutrients Bug Away. Both are safe and non-toxic. Cold temperatures or nutrient deficiencies can cause bronzed or reddened leaves. Flush the rootball, repot in new root zone media, then re-fertilize. Insufficient light, cold temperatures, and nitrogen deficiencies can cause small pale leaves, spindly plants and slow growth. Brown leaf tips and margins can be caused by exposure to hot dry air, improper watering, insects, inferior fertilizers, fertilizer toxicity or objects rubbing against the leaves. Chlorinated water containing fluoride can also harm houseplants. Perlite (the white pellets present in many potting mixes) and fertilizer products containing fluoride may release enough fluoride to harm sensitive plants. Spider plants, especially the variegated variety, suffer leaf tip burn due to fluoride. Advanced Nutrients products do not contain fluoride. Bleached or faced spots on leaves are sometimes caused by direct sunlight burning plants that require shade or are not yet accustomed to large doses of direct sunlight. Chemicals and plant cleaning products can also injure leaves. It is best not to use leaf shine or leaf cleaning materials at all. Mist leaves with distilled water and keep plants in an aerated, smoke-free room to keep leaves clean. Poinsettias require bright light and should be kept away from drafts. After the initial seasonal red leaves fade or fall, place plants where they will receive indirect light, with temperatures around 55-60 degrees F.
Water sparingly during this time, just enough to keep the stems from shriveling. Cut the plants back to within about 5 inches from the ground and repot in fresh soil. As soon as new growth begins, place in a well-lighted window. Unless there is danger of frost, place the plant outdoors in a partially shaded spot. Pinch new growth to create several new stems. During autumn when the nights have cooled, bring the plants indoors to a sunny room and a night temperature of approximately 65 degrees F.
The poinsettia blooms only during short daylengths. It is sensitive to how much light falls on it, and for how long. 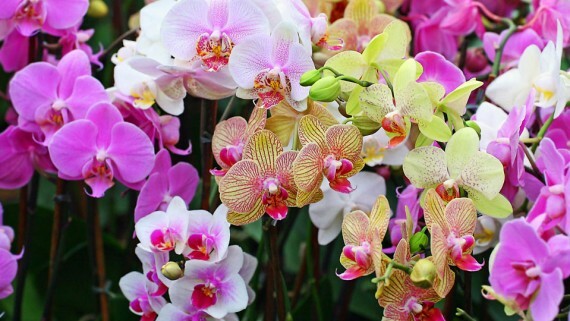 To initiate blooms, only expose the plant to 12 hours or less of light per 24 hour period. If you do this procedure correctly, you can turn the red growth of poinsettias on when you want to. Azaleas require direct sunlight to remain healthy. Night temperatures of 60 degrees F will prolong blooming. Keep soil constantly moist. If leaves should turn yellow, the soil is not acidic enough and you should consult the Advanced Nutrients technical advisor to determine how to create an acidic root zone environment for your azalea. Azaleas need to be given very cold temperatures if they are to be successfully triggered into bloom. Place them in a 35-55 degree F environment and low light for a few weeks. The trigger blooming by placing then in a room with temperatures that are between 65-72 degrees F.
Gardenias smell great but they are hard to grow indoors. They need acidic soil, night temperatures of 60 degrees F, and high humidity. Avoid high temperature and low light intensity. The secret of growing amaryllis to create a repeat bloom performance is to keep plants actively growing after initial blooming. Keep plants in full sun with night temperature just above 60 degrees F. When frost danger has passed, put plants in a semi-shaded garden space. Before autumn frost, bring them inside and store the bulbs in a cold dark place to rest. When you want the bulbs to start new growth, bring them into a warm, lighted room. Give them strong light and a fertilizer booster. Christmas cactus blooming is controlled by temperature and the duration of light they get in each 24 hours period. They tend to bloom the best when they get bright light, short daylength, and nigh temperatures between 50 and 65 degrees F.
Cyclamen need full sunlight and night temperatures between 50-60 degrees F. They need lots of water and will not produce floral buds if night temperature is too high or if day light intensity is low. Please note that Advanced Nutrients makes many floral-enhancing products that will increase the color, shape, longevity and beauty of houseplant blooms. No matter what type of houseplants you’re growing, you can get the best from your plants by using quality fertilizers, giving plants quality root zone media, establishing ideal environmental conditions, and protecting them from pests, diseases and other problems.